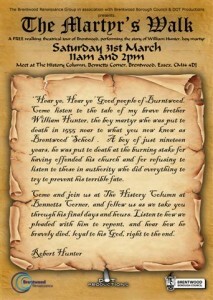 Old Macdonald, who always considers himself a bit of a martyr given that he works so had to bring you fun and education, and himself a couple of bob, will take time off on March 31st to celebrate the life, and tragic death, of a real Martyr from Brentwood, William Hunter, as he goes to enjoy the second Martyr’s Walk, This event, supported by Brentwood Council and run by our friends from Brentwood Community Theatre, brings the past to life today. 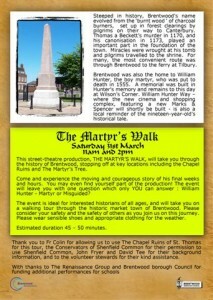 To join him come to the History Column at Bennetts Corner at either 11 am or 2 pm. William was burnt at the stake for keeping to his beliefs. In July we will all be taking part in Sparks Will Fly in Brentwood to welcome the Olympics and we will tell you more about that later. Poor old William found sparks flying too, but that was not so much fun. For him anyway. Old Macdonald is pretty pleased with himself today as his new Fun Fact trail is up and running, with 27 information boards all around the farm full of interesting and entertaining facts about your farmyard favourites and the more unusual animals we have here in Brentwood. From rabbits to rheas, owls to otters, and goats to guinea pigs you will all, young and old alike, learn a lot from these. Ideal for schools as part of their studies, these boards include information on conservation, habitat, geographic location in the wild and population too, as well as the economic importance of many of these creatures. However, they are great fun too, nothing heavy about them. 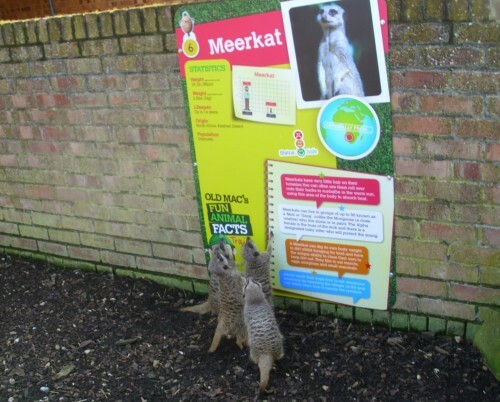 As you can see, our Meerkat family have been studying their boards in case you ask them tricky questions when you arrive, and do not forget for goodness sake do not let them sell you any of their dodgy insurance policies.